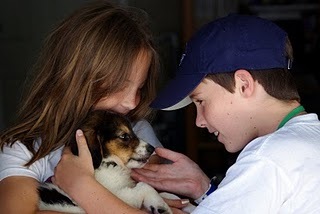 Much to the surprise of many people, we do not use an adoption application but rely instead upon an interview process. Because we are a small rescue and keep all of our dogs in foster homes, we shy away from forms that tend to emphasis why someone should not have a dog. The interview process allows us to learn more about our potential adopters and their individual situations, concerns, pros and cons. By knowing more details, we are able to place dogs into homes that other rescues might turn down, because we already know our dogs. We’re small so we don’t need blanket policies that require fences or disallow families with small children or won’t allow senior citizens. We’re focused on bringing together caring people with the right dog. Whether you are considering an adult dog or a puppy, the first thing you should do is read our article on Starting Your Dog Out Right. Here you will find not only some good tips but some thoughts to ponder before committing to the responsibilities of caring for a dog. are you prepared to bring your new dog home if you are approved after you meet one of our dogs? Email your answers to TheDogLiberator@gmail.com, and then we’ll go from there! The more you share the better! Visit us on Great Nonprofits and read our reviews! Thanks so much for the wonderful site and information you have. My wife and I have been looking for a dog for a few months now to join our family. To say the least it has been a discouraging process. The only places I have looked are petfinder.com and the local pound. If you have any questions about our adoption fees, please read more about our adoption fees. I wish I can have a Border Collie someday!